The third and final dance/music/visual art collaboration between Rebecca Stenn Company and photographic artist George Del Barrio presented by The Vanderbilt Republic at Gowanus Loft. 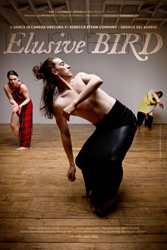 Elusive Bird is the third and final evening length component in a trilogy spanning five years of creation and performance presented by The Vanderbilt Republic at Gowanus Loft. Choreographer/dancer Rebecca Stenn and photographic artist/creative director George Del Barrio began their collaboration almost 20 years ago with a series of photographs. Their work together has since grown and flourished and manifests itself now with the creation of Elusive Bird, the final portion of their trilogy of evening length performances at Gowanus Loft. Each of the three components of the trilogy utilizes projected images, dance and live music in completely distinct and radical ways. The first iteration, a solo performance called Time I Know, premiered in January 2014. Oberon’s Grove writes, “Rebecca Stenn's is a truly unique choreographic 'voice' and she is a dancer of unusual power and grace…...watching her is mesmerizing and I wanted the piece to go on and on so that she could continue to cast her spell." In June 2015, Del Barrio and Stenn premiered the second iteration, a full company work Riparius (belonging to the river). The New York Times writes, “Memorable choreography...best are stop-motion images of the dancers, which have a ghostly effect, as if the walls were movie screens for spotty memories of the dance...shifting, sculptural...strong”. Jumping off the successes of Time I Know and Riparius (belonging to the river), Del Barrio and Stenn continue their collaborative experiments in immersive performance production by crafting one final work to complete the trilogy. This new evening length work, Elusive Bird, explores the form of the duet; how two people moving together on stage hold between them a microcosm of the way we interact, breathe and love. The work is inspired by Rei Kowakuba’s recent exhibit at the Metropolitan Museum of Art, has led to exploration about the concept of binaries -- not exactly opposites, but two things together, existing in the same space and commenting on each other, sometimes quietly, and sometimes by raging. Through the use of camera obscura projected imagery, audience members will experience photographic darkness followed by bright, white light, and themes of gender, space, sound, silence, age and youth come to the fore. The trilogy in its entirety has been produced at Gowanus Loft, a project space in Brooklyn that has recently presented much of the most creatively original, technologically innovative work in the region. Elusive Bird is choreographed and performed by Rebecca Stenn, Quinn Dixon, Trebien Pollard, and Megan Williams, with lighting by Kathy Kaufmann, costumes by Elie Weissman, and music performed live by a four-part choir singing William Byrd’s 10th Century Motet Ave Verum Corpus, as well as live electric bass performance by composer/musician Jay Weissman. Performances are at Gowanus Loft, July 12-15, 2018 at 8pm.